Zinc finger nucleases (ZFNs) - proteins designed to cut at specific DNA sequences - combine the non-specific cleavage domain (N) of FokI restriction endonuclease with zinc finger proteins (ZFPs). Because the recognition specificities of the ZFPs can be easily manipulated experimentally, ZFNs offer a general way to deliver a targeted site-specific double-strand break (DSB) to the genome. The ZFNs were originally developed in our laboratory. They have become powerful tools for enhancing gene targeting in cells – the process of replacing a gene within a genome by homologous recombination (HR). The development of ZFN-mediated gene targeting provides molecular biologists with the ability to site-specifically and permanently modify plant and mammalian genomes including the human genome via homology-directed repair of a targeted genomic DSB. Site-specific engineering of the human genome in vivo so far has been hindered by the low frequency of HR. In ZFN-mediated gene targeting, this is circumvented by using designed ZFNs to cut at the desired chromosomal locus inside the cells. The DNA break is then patched using the new investigator-provided genetic information and the cells’ own repair machinery. The high efficiency of this process combined with the ability to design ZFNs that target almost any DNA sequence makes ZFN technology a powerful research tool for targeted engineering of the human genome. The current gene therapy protocols, which are based on gene addition approaches, try to compensate for defective genes by randomly inserting a new working copy into cells. These approaches are beset with complications arising from the random insertion of the therapeutic genes at undesired loci of the human genome. The ZFN-based strategies could provide an efficient and effective means of directly and specifically editing “defective” bases in genes, making gene correction a viable option. It has the potential to dramatically change the field of gene therapy. 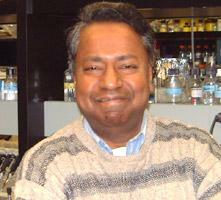 Durai S, Bosley A, Abulencia AB, Chandrasegaran S and Ostermeier M (2006). A bacterial one-hybrid selection system for interrogating zinc finger-DNA interactions. Journal of Combinatorial Chemistry & High Throughput Screening 9: 301-311. Durai S, Mani M, Kandavelou K, Porteus M and Chandrasegaran S. (2005). Zinc finger nucleases: Custom- designed molecular scissors for genome engineering of plant and mammalian cells. Nucleic Acids Research 33: 5978-5990. Kandavelou K, Mani M, Durai S and Chandrasegaran S. (2005). ‘Magic’ scissors for genome surgery. Nature Biotechnology 23: 686-687. Mani M, Kandavelou K, Dy JF, Durai S and Chandrasegaran S. (2005). Design, engineering and characterization of zinc finger nucleases. Biochemical Biophysical Research Communications 335: 447-457. Mani M, Smith J, Kandavelou K, Berg JM and Chandrasegaran S. (2005). Binding of two zinc finger nuclease monomers to two specific sites is required for effective double-strand DNA cleavage. Biochemical Biophysical Research Communications 334: 1191-1197.